Push Your Luck Podcast: Manliness, Sailing, Racing, Outfoxing, Tiring... Eric's Back! A friend came shortly after and we played Oink Games newest release - MaskMen. I was very keen on the game as most of Oink Games games are pretty decent; and with art and components like that, how could one not be excited? 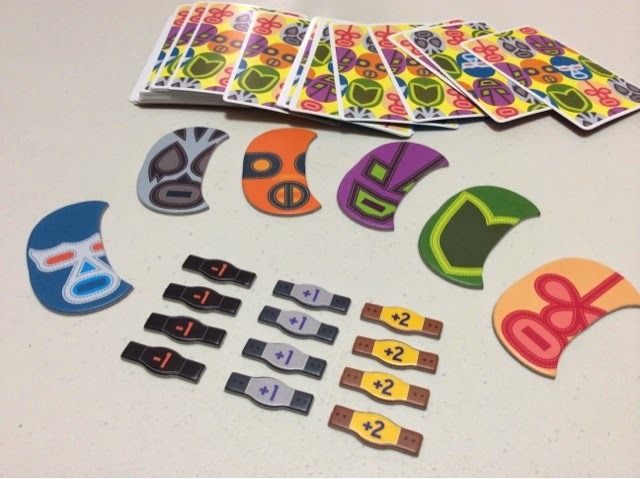 MaskMen is a climbing type game where players are rushing to clear their hand of cards. Unlike regular climbing games, the value of each card is determined based on when the card is played. So if you play the purple card first ( which must be played alone ), then it will very likely end up to be the color of least value. The next set must be played with 1 card more than the last set played. No one may play more than 3 cards in a turn. Where things get complicated is after the first set of 3 cards are played. The round "ends" so to speak and that player may either introduce a new color, or continue to play cards of the same color as those already played. 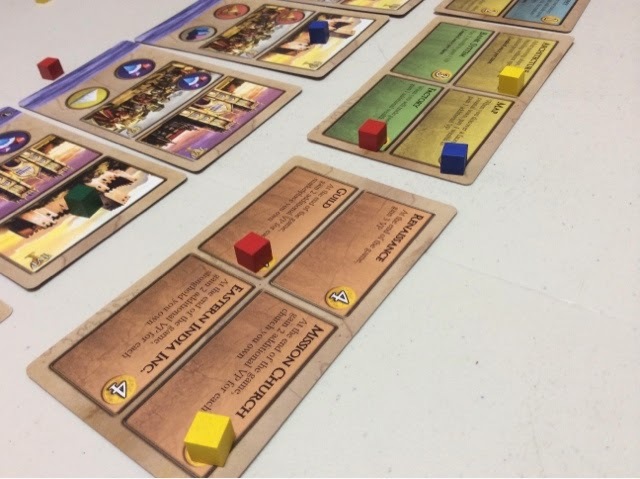 Once the first "round" has ended, they would be 3 out of 6 colors on the table, this is where the rules change slightly whereby players may introduce any of the 3 other colors, or play cards that match the colors already present on the table. There will be some reshuffling of the power of each color played this way ( which I cannot explain properly without showing you the components ) but its suffice to say that all this is done with the same purpose of getting rid of your cards and playing combos whereby you may play consecutive turns by playing a high number of cards or by playing cards of the most powerful color on the table. Beautiful components aside, this game did nothing for me. I hated the luck of the draw, I hated the near inability to control the power of the colors in a meaningful and strategic way. Most of the time is spent on simply playing cards that you can play because it's power is strong and in play when your turn comes. There will be multiple times when your turn comes around and you just sit there with no cards to play simply because you don't have the right quantity or the right color - which is of no fault of my own! Oh, before I forget, players score points for when they finish all the cards in their hands ( +2 for the first, +1 for the second, -1 for the last ). Most points win. Well, felt like everybody lost actually. We went from wrestling masked men to chinese junks. We had to keep the tradition of new games with Eric so we took out as many new ones as we could. Haha. I had written about Madame Ching recently in my previous session post, so I won't rehash how the game is played once again. What I failed to show the last time though was how the mission tiles looked like and what benefits they grant. So in theses 2 photos you can see what numbers you need to complete the mission and what treasure it yields you in the process. The higher numbers will always give you more points, but sometimes you may forsake some points for the chance to nab some encounter cards. Each coin is worth 1 point, each blue jewel two, red jewel 3, and white jewel 4 points. For those wondering why tile 29 offers 6 coins instead of say 2 red jewels, that is because jewels have the propensity to be stolen via encounter cards ( coins cannot ), but on the flip side, there are encounter cards that give you one more point each for a color of jewel of your choosing. So there are both good and bad reasons why you might want coins over jewels or vice versa. Above the mission tiles are the cards that you gain by collecting expedition symbols. They are called skill cards and offer you a one time ability in-game. 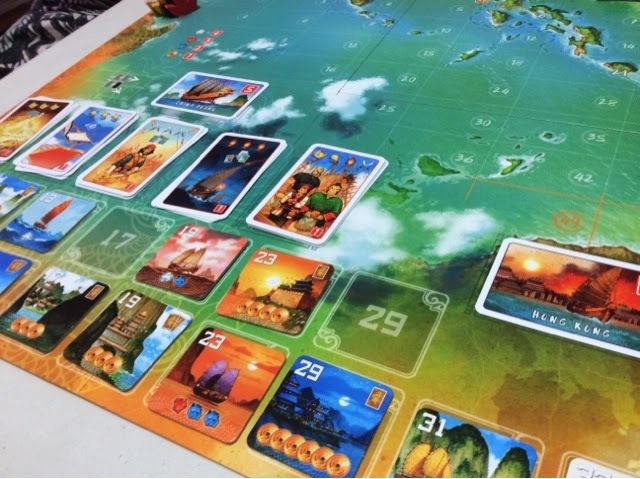 A quick run through from left to right - add one more navigation card to your hand, add 6 value to a mission score, glance and exchange navigation card with an opponent, insert an expedition card mid expedition, no ability but counts as a wild card for gaining China Pearl. Previously, I said that I enjoyed my first play of Madame Ching; for my second play, I didn't enjoy it as much. I still had fun with it but I think the experience was somewhat marred by me having to constantly reexplain the flow of the game ( it's really simple! ) and also there was quite a bit of downtime with the players not knowing how certain encounter cards work. One thing I did notice is that with 4 players, the missions were snapped up much quicker than my previous 3 player game. With 3 players, 12 missions are used, with 4 players 14 missions are used. The increase of 2 is not enough for all 4 players that everything felt very tight. Which is supposed to be good, but when the missions are gone there isn't really much to fight for after that. I think the game could have benefited by having more missions of higher value, so the race to go further would be more exciting. Nonetheless, I like it still and its one I would fall back to for a fast playing easy going set collection game. I think my replayability doubts from my previous report seems to be spot on though, as I can see that after awhile this might not have as much longevity as I hope it would have. 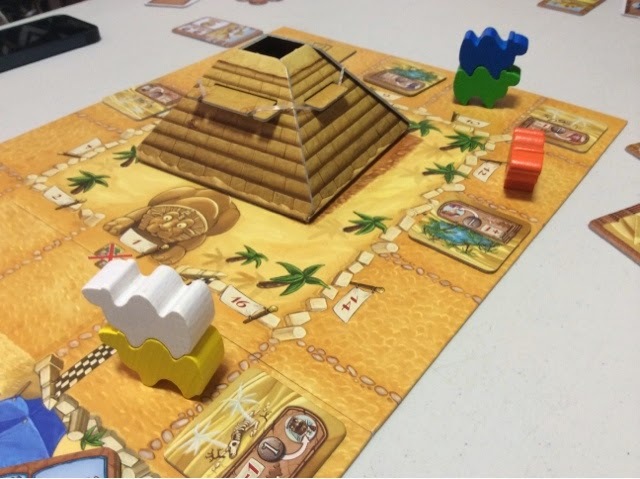 For our last 4 player game before our fifth player arrived, I took out Sail to India since it was new to everybody else. I'm going to make this really short ok? Cos I said I didn't quite like it the first time I played it, well, after my second time, I'm done with it. Haha. It was sold to our other friend, on the spot. I just don't understand why people are fascinated with this game! I just feel like I am doing the same thing over and over again. Get money through selling goods, use money to buy tech or upgrade ship or buy buildings, rinse and repeat. Yes you may choose to sail to get points, or stay behind and slowly build buildings and sell more goods for multiple points, but that's all there is to it. There really isn't multiple paths to victory. There are only 3 buildings in the game. The technologies available are meh. Haiz. I really wanted to like this, honestly I tried. But it's just so going through the motions. Sail, take goods, sell them, then decide how to use your money. When you run out, do the same thing again. Granted, cube management is important, timing is quite key in how your engine works. But cube management does not interesting a game make. I think of the 4 players who were involved, only 1 of us really enjoyed the game. I'm pretty sure Eric is kinda meh on it too. 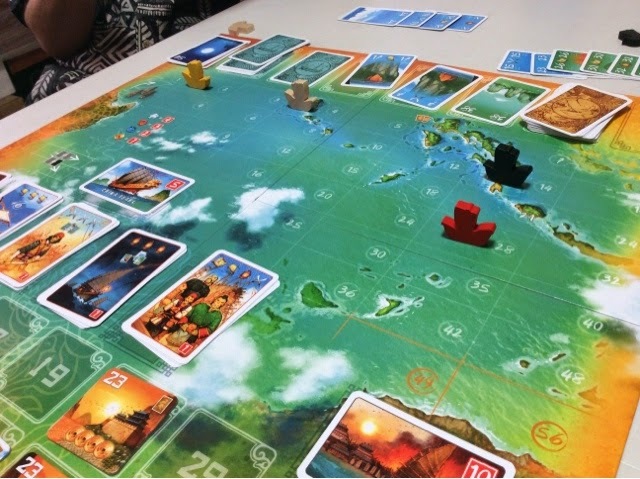 If I were to compare the 2 sailing games - Madame Ching and Sail to India, Madame Ching was faster, more beautiful, simpler to teach, and yet more fun. So there is no reason why I should play Sail to India ever again. Sail on home Sail to India. The first bad sign came when I started explaining the rules. There were 5 of us playing and all of us are experienced gamers who handle heavy games well. So during my explanation, there were a few "that's it?" moments - both vocal and facial expressions. Haha. I told them it was light but I think they were not expecting it to be THIS light. There are only 4 actions in camel up, none of which are actually mind blowing. Haha. You bet, you race, and you hope to earn the most money by game end. We started off really fast, a few blind bets on the eventual loser were placed, a lot of dice rolling was done, and it was only somewhere one third of the game in where people started realizing the importance of taking the betting tiles and not rolling dice to give away important information to the other players. All this while, a few of them were like "let's roll the dice to make the game end faster". Haha. But as all gamers know, the eventual thirst for the win will always spring to life even if it's a simple party game. So towards the end, dice rolls were careful, bets analyzed a little bit more strictly than at the beginning, and suddenly turn order mattered for a very short while. Who is going to roll the dice to tell us how the camels will be stacked? 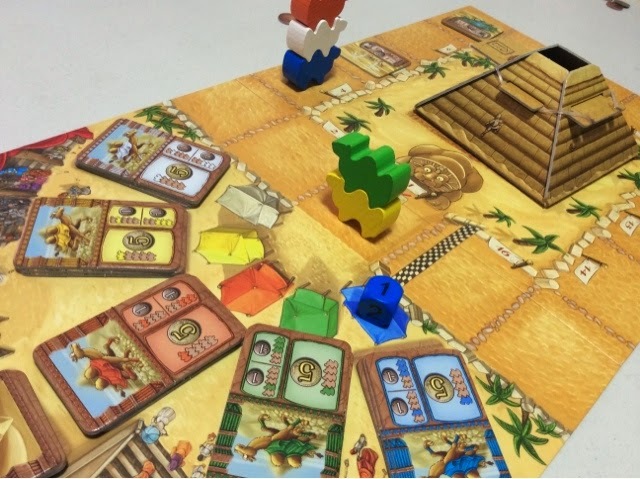 Will that tile on the board make the first place camel move back to second place instead? Away from the pack. Only one clear winner now. From betting on Camels, we went to betting on Horses. Horse Fever took the stage yet again! Horse Fever! Horse Fever! Horse Fever! I lost to Eric on the tiebreaker which makes me sad. Haha. But I'm glad that he liked the game enough - or so I think. The atmosphere was not as rowdy as I normally am used to, but then again, maybe it was the presence of 1 older gentleman and 2 trying to be demure ladies. Who knows? Who cares! I was having a bunch of fun! Eric has been raving about this since he was in London. On Twitter, Facebook, every time he played it, I see him talk about how great the game is. After the failure of the previous climbing game MaskMen, I was hoping this wouldn't be a dud. In Abluxxen, players try to play sets of cards to rid their hand of cards to score the most points. Players play exclusively on their own tableau, so the size and value of the opponents' sets don't hinder what you can or cannot play. If you want to play it, you will always be able to play it. The trick in Abluxxen is that if you were to play a set of similar number of cards as any opponent, you have the chance to eat their set, or to leave the decision to them to take it back or discard it and draw new cards - this is provided your set is of higher value than theirs. This allows a lot of player interaction whereby you don't always want to play high sets because you may want your opponent to eat your set to allow you to draw new cards from the table. Or you may play a high set to protect your previous set or just simply hoping that others don't have as many cards of the same number that you just put down. This mechanic made Abluxxen feel entirely different from anything that I have played before. It was genuinely interesting and engaging throughout. I think Abluxxen is a pretty decent game, however our play with 5 players made me feel that it shouldn't be advertised as a 5 player game. Having some sense of control in a climbing game is important as without it, it becomes simply a play whatever cards you have type of game. Heck, even UNO has some control even though it is pretty random. With 5 players, Abluxxen lost a bit of its charm for me. I can see it working spectacularly as a 3 player game, and pretty good as a 4 player game. But with 5, by the time it comes back to your turn, you may have missed the chance to eat something you want, or you may have had to take new cards that you weren't planning for. With lesser players, I could play a small set knowing that the new cards I would take are more or less face up on the table. But with more, the face up cards change faster and my plan to take new ones would be moot as things can change quickly before you know it. I would like to play this with 3 or 4 soon and see for myself how much better it can be. It likely won't end up in my collection as my groups don't appreciate climbing games, but I can see how people who do enjoy climbing games would get a kick out of this. Before heading off for our dinner break, we decided to jump into a quick game of Perudo ( Liar's Dice ). I've always loved Liar's Dice as it's such a pure bluffing and reading your opponents game. For those who have never played, each player is given a cup and some dice. Players roll simultaneously and go around making bids claiming that there is a certain number of a value of dice in all the players' cups. Players may not pass when it's their turn, instead they must either increase the bid in terms of the number of dice ( three 2s compared to two 2s ) or increase the bid in terms of the dice value ( four 5s compared to four 4s ). If the player is unwilling to do so, he/she may call the last bid a bluff and all players will reveal their dice to see who is right. The losing player will lose a die and the winner is the last player standing. It's your typical beer and pretzel or pub type of game, but I really like all versions of Liar's Dice. I'm slightly tempted to bid for Eric's copy on his auction.. We'll see. We actually played a 3 hours plus game of Nations before ending the day with Snowdonia. I won't talk about Nations now though, saving that for another post. I'll just end with Snowdonia instead. This was my second time playing this game, the first time I played it it was also dead into the night. Haha. There's something about playing this game right before going home maybe. Anyway, I had a very positive impression of Snowdonia on my first play through, so I thought a second play through was very much due. 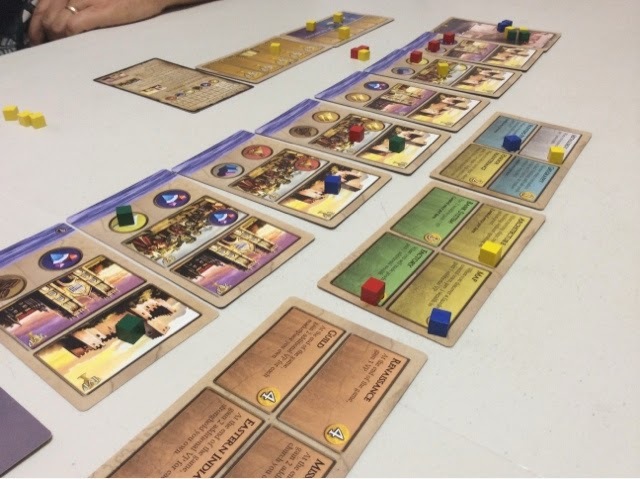 Snowdonia is a worker placement game where players have a meager 2 workers to do everything that they wish to do. There is a way to obtain 1 extra worker but that comes at a cost on a per round basis - very expensive. In Snowdonia, players are trying to amass the most points by converting resources into stations, tracks, and something that is also track like ( I forgot the name ). Those are the clear outright ways to score points. Collect grey cubes to turn into stations, or orange cubes to turn into tracks and then use those tracks to build the track like station or to simply lay tracks for points. The laying of track is what determines the end of the game. Once all the tracks are laid, that is immediately considered the last round. The stations and tracks do not have fixed points, so the earlier you are to a space, the more points you will be getting. 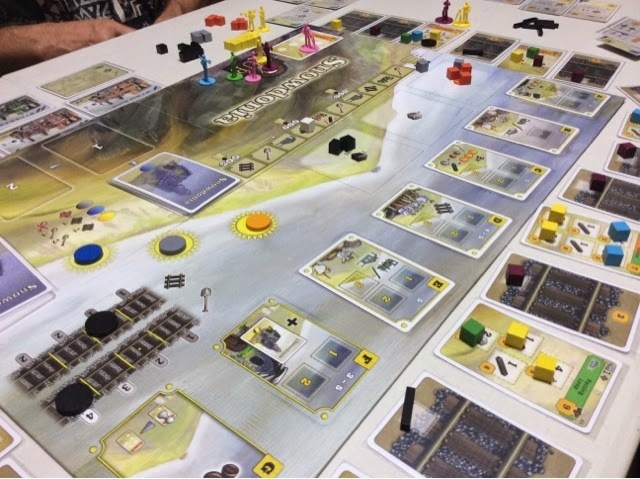 The part that makes Snowdonia different from other worker placement games is that when you place your workers, you may place it anywhere in the queue for that action spot. So if an action has 3 spots, you don't have to take the first spot, you may opt to take the second spot and hope someone else fills the first spot instead. The reason for this is that there is an action space whereby players will clear rubble from some cards. Only the player who cleared the final rubble in each space will get the points. So going first may not always net you the points that you were aiming for. It's something small but it is different. Snowdonia also has cards that players may claim with a worker. These cards are pretty cool as they have 2 areas on them - one gives you a one time special action, the other is an end game scoring condition. These can range from having a certain number of rubble cubes to laying a certain number of tracks. In short, everything is nicely intertwine in Snowdonia. The game only has 2 main resources, so the fight is on from the very get go. Every spot is useful at certain times, and those are usually the times when everyone else wants a piece of the action. On my previous play of Snowdonia, we played a somewhat mini expansion of it. So I focused my efforts on creating spaces for my surveyor to travel on. And I went for the "be faster on the higher scoring space" kind of strategy. It worked out pretty well and I came out on top. This time, I decided to not touch the surveyor, buy at least 1 train, and do a track or rubble strategy. Well, I met all 4 conditions, which turned out to be a bad idea. I should have stuck to either a track or rubble strategy, my mix of both pushed me off track on everything. Jack of all trades and king of none. I was dead last - by a lot. Haha. I regretted buying the train as it was of little use to me. The train cost me 2 track pieces which I should have used to focus on a track building strategy and end game scoring. Rubble was taken by Eric and his train so that really put me behind on the rubble business. The game was tiring though, surprisingly. I don't think it was just for me but for everyone else. I think Snowdonia after Nations was not a good idea. The game only took 90mins, which is fantastic, but it felt like 150mins to me. Everything seemed to slow down and my head got tired near the end of the game. I still think Snowdonia is a pretty good game, but perhaps not one to close off the night. Not sure if I will get a chance to play this again but its one that I would certainly not turn down. Must say I disagree and love Abluxxen with 5, however. The more you play the more you see things to do even if the cards aren't falling right. The game becomes more "how can I slow the others" and less "what can I do to help myself?" Well, I hope that you will be able to find fun in the games that are coming to you! Our taste in games might be completely different for all you know! I do agree that I can do other things in Abluxxen with 5, but from your experience, what happens if you try to slow others down but the other players who aren't so good at that just keep letting the others eat or run away with it? Does that make your effort meaningless?